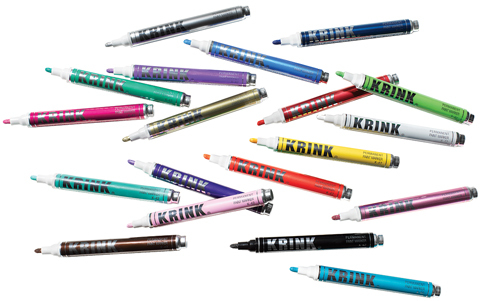 The K-42 paint marker's vibrant, opaque colors are permanent, fade- and water-resistant and easy to use. The marker features a broad-tip with valve-action so that the artist can lay down an abundance of color while strictly regulating the paint's flow. The paint is alcohol-based, does not contain harmful solvents, is xylene-free and conforms to ASTM D-4236. Each markers contains 10ml of paint. Handmade in the USA.